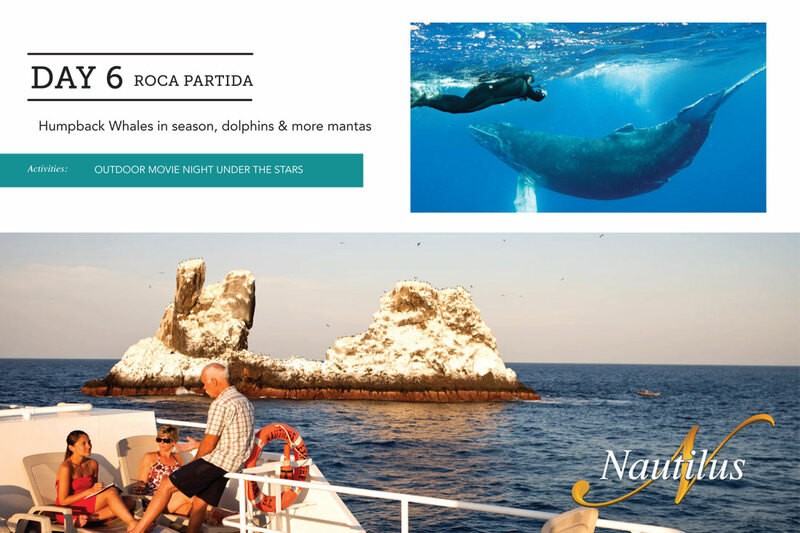 We Know Big Animal Diving : Nautilus Belle Amie – Luxurious Liveaboard Dive with Giant Mantas at Socorro or Cage diving with Great White Sharks of Guadalupe Island. 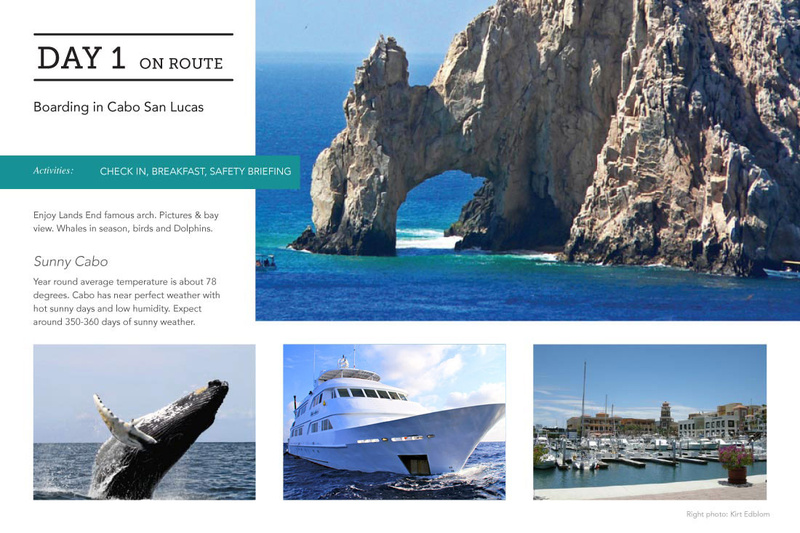 With over 25 years of experience, we have a pretty good idea of when and how to get you in the water for the best possible diving experiences off Baja California (Mexico). 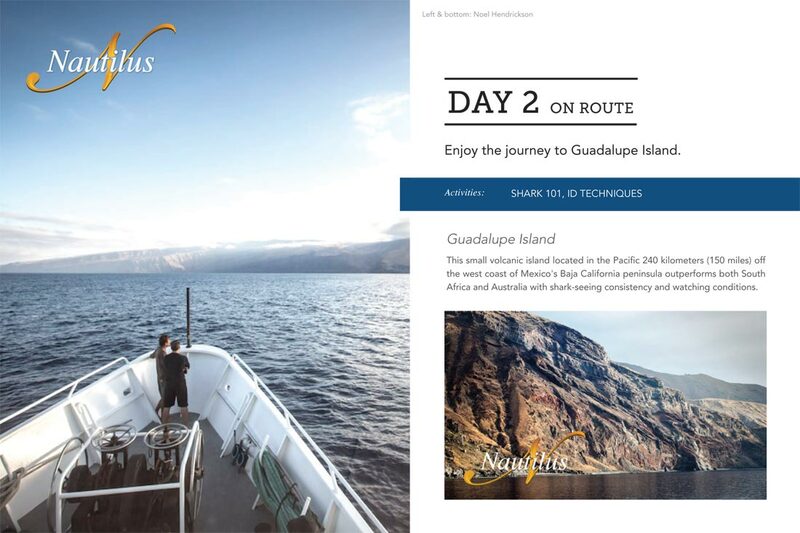 Our trips are scheduled to follow the natural rhythms of the most interesting Baja diving whether it's intimate encounters with the giant mantas, dolphins and 10 kinds of sharks at Socorro Island or diving to 30 feet with the fascinating and surprisingly calm great white sharks of Guadalupe Island. 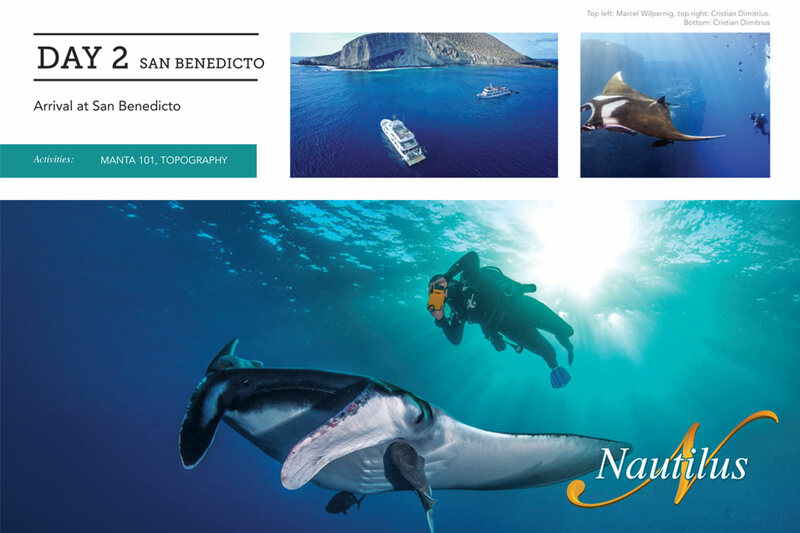 Socorro Island offers some of the best big animal diving imaginable. 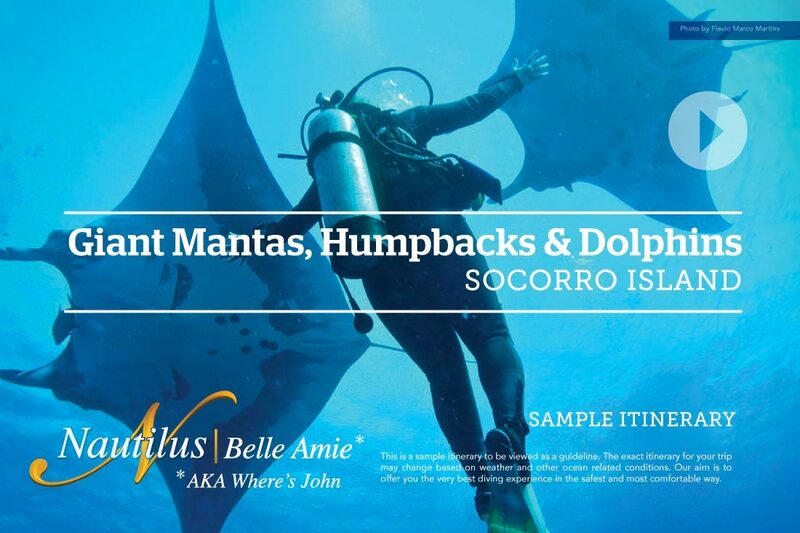 For over 25 years, Socorro's giant mantas have been interacting with divers in intimate encounters that are often the dive of a lifetime. These consistent up-close interactions with both chevron and jet-black mantas are unique in the world. We liken it to being on safari in Africa with a giant elephant coming out of the bush to go for a companionable walk with you. 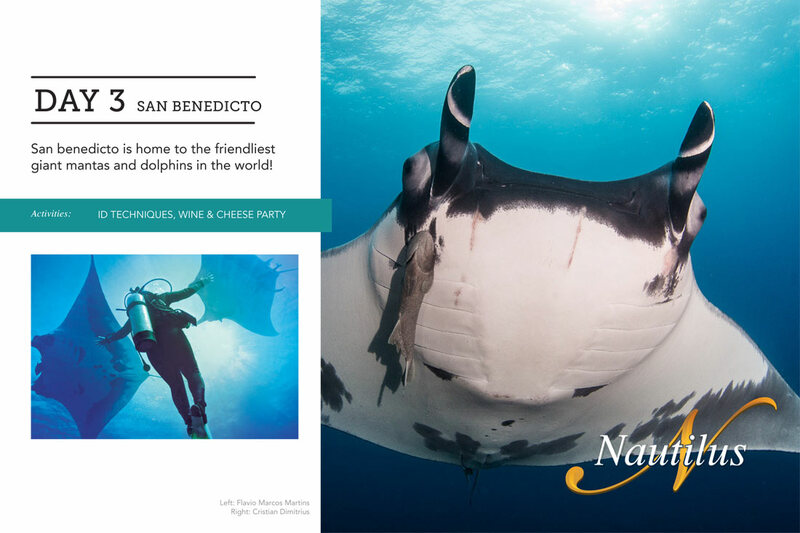 In recent years, we discovered a pod of dolphins that love interacting with divers as much as the mantas. 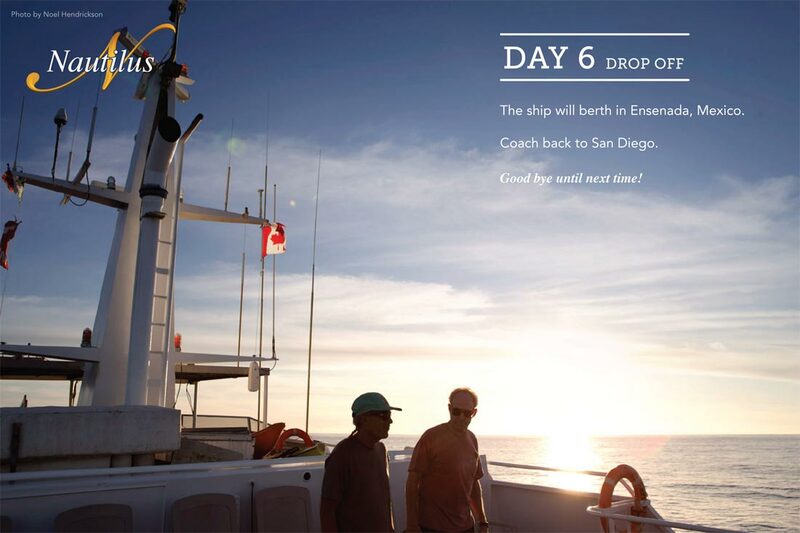 Imagine a fully grown bottlenose dolphin swimming up to you in open ocean and touching you with a pectoral fin!! 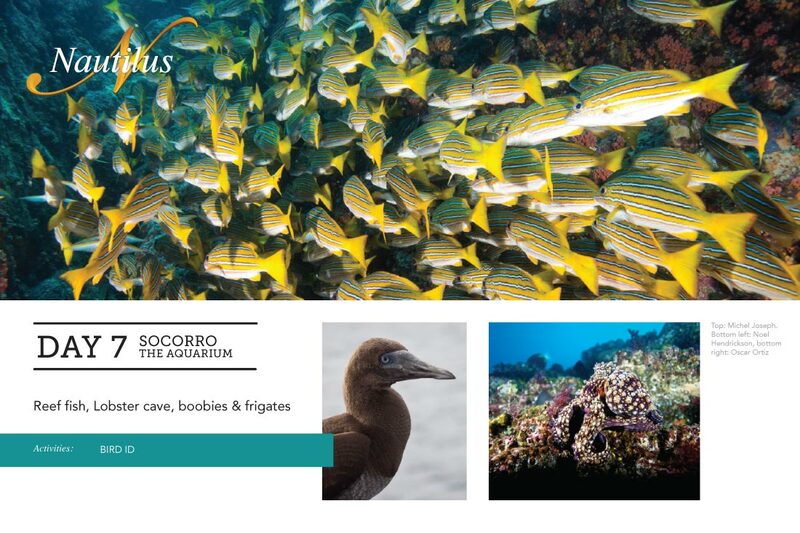 Socorro has also become known for humpback whale encounters, 10 kinds of sharks including schooling hammerheads and silkies as well as whalesharks, white tip reef, silvertip and galapagos sharks. 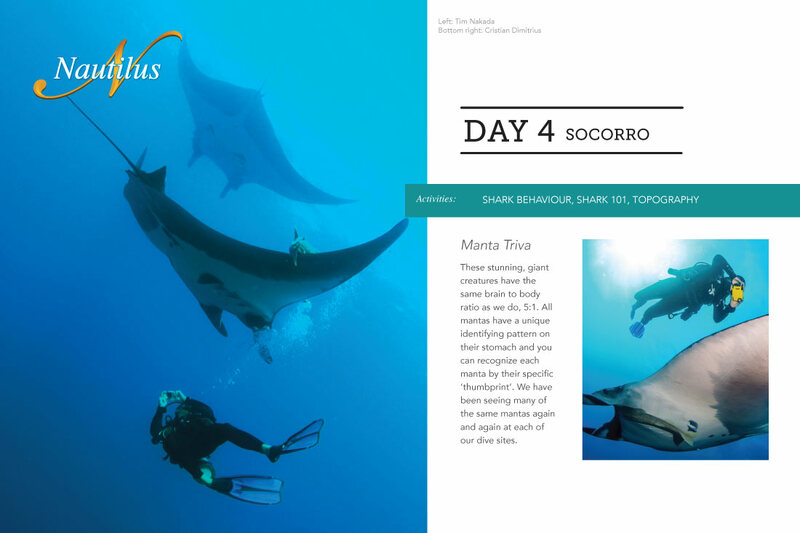 Socorro is a definite must-see for any diver interested in big animals. 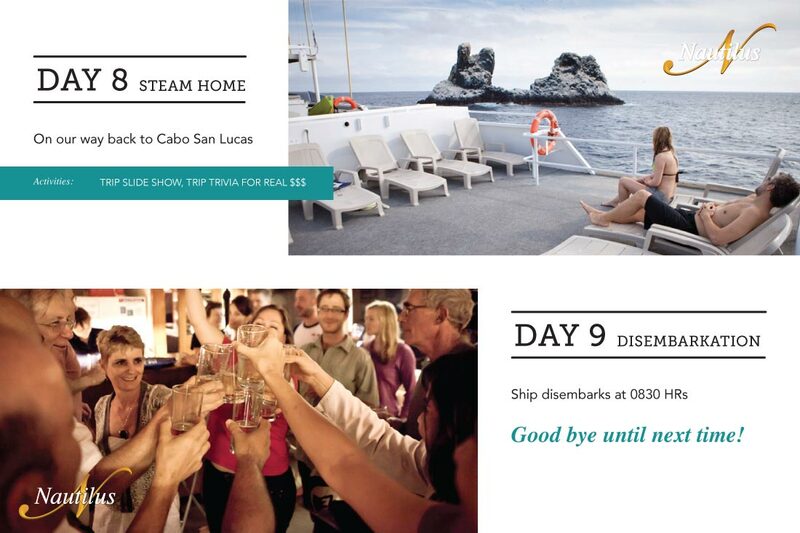 Please note the above sample itinerary is based on 9 days 2014 Socorro AM departures. 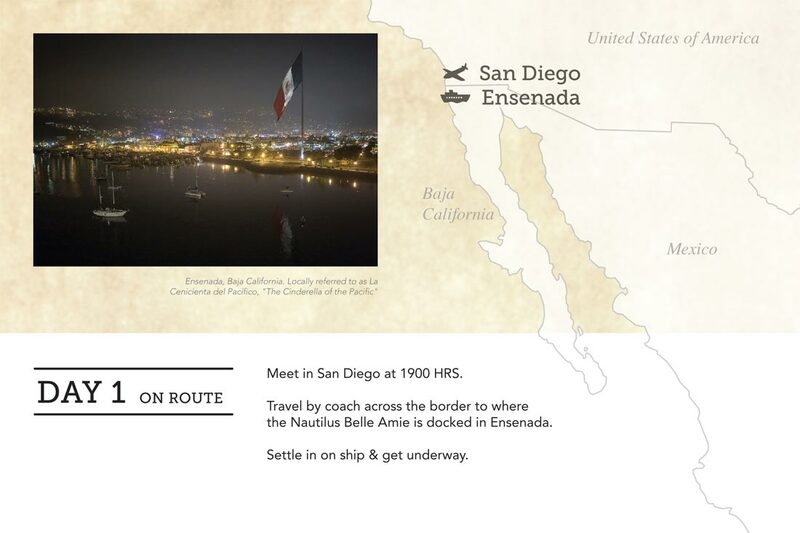 Please contact us for your trip's sample itinerary. 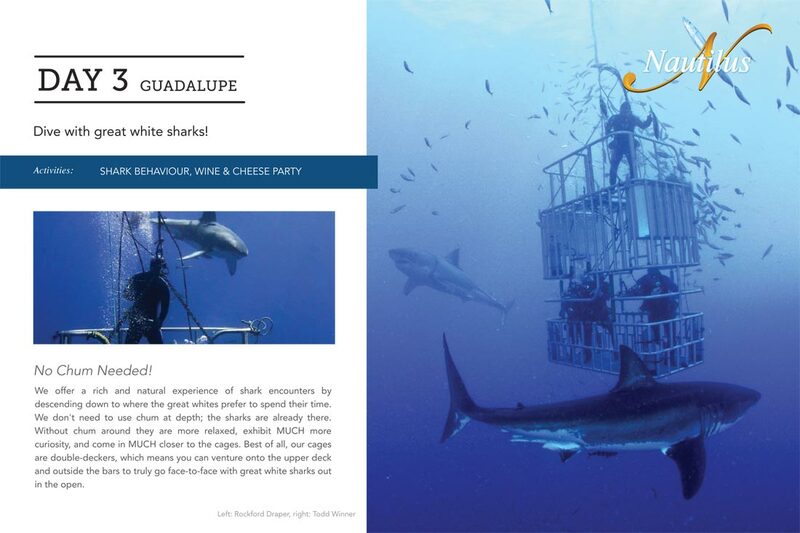 Not all divers are interested in diving with great white sharks. 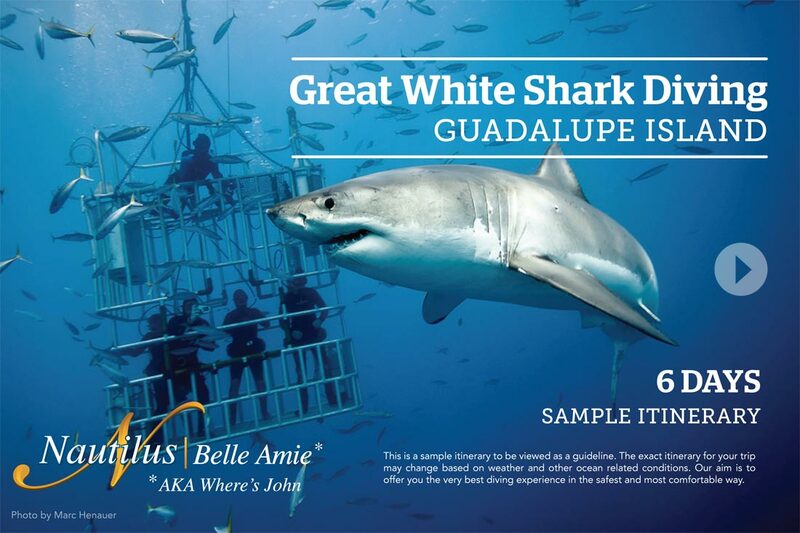 Actually we should say "divers think they are not interested" until they get persuaded to sign up for one of our Guadalupe Island white shark adventures. 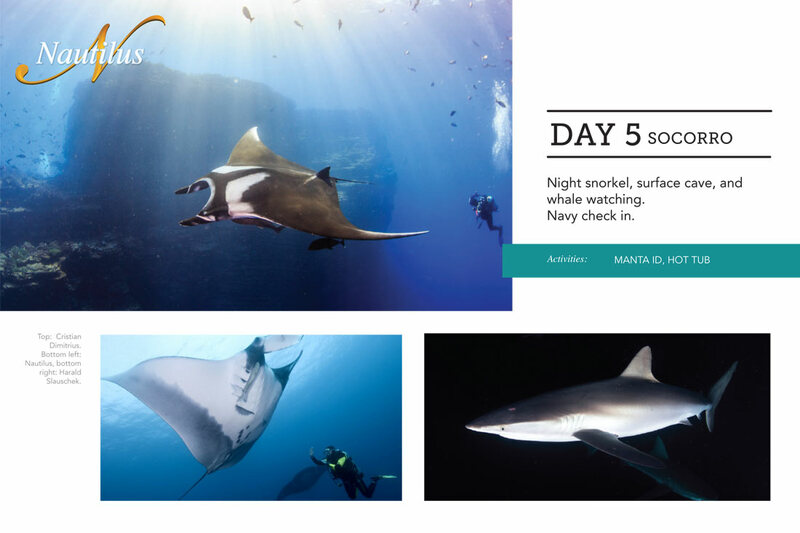 The reality of diving with these fascinating animals is very addictive and very different than most divers imagine. 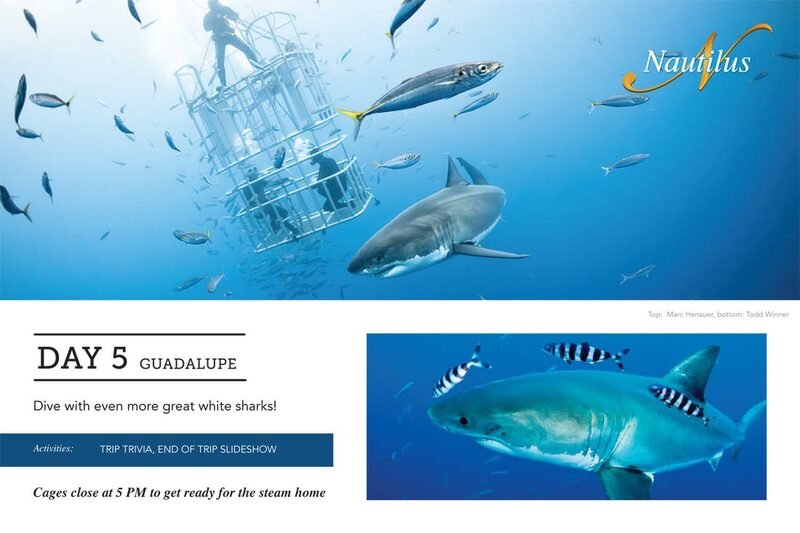 Each shark has it's own unique personality which becomes evident after diving to 30 feet with the great whites in our submersible double decker cages. Each submersible cage will take 3 divers and 1 divemaster.  There are 3 submersible cages on the Nautilus Belle Amie, rotating 3 times a day. What makes our diving especially unique is that we use only the bare minimum of tuna bait necessary to engage the interest of the white sharks. Great whites are able to detect even a single molecule of scent which makes it unnecessary to subject divers to slicks of oil, blood and chum on the surface. 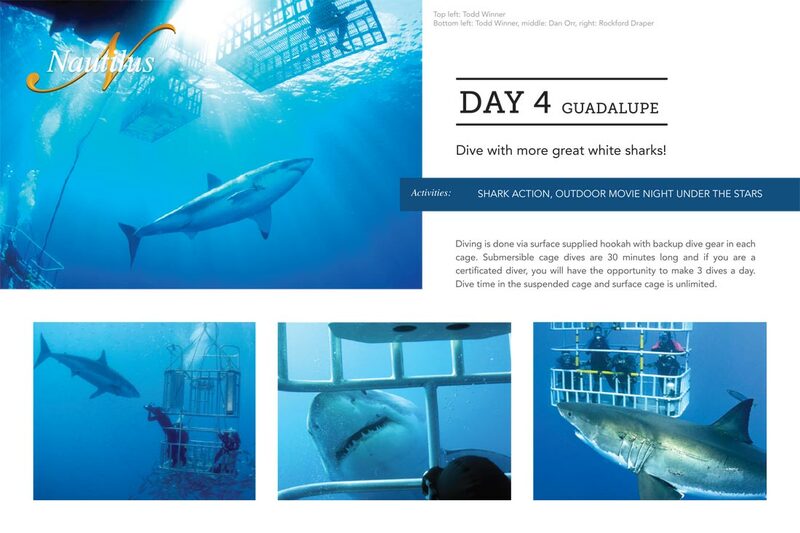 We believe that using submersible cages to dive down to where the sharks prefer to hang out combined with natural interaction provides far more shark sightings and interesting behaviour than keeping divers cooped up in tightly scheduled surface cages. You owe it to yourself to dive with great white sharks at least once! !